Clockwise from top left: Tex Texin, a GALA-IMUG Local Networking Night, Dr. Ken Lunde, Brendan Clavin, Uwe Muegge with an audience at Google, and Talia Baruch. Meetup hosts the IMUG event calendar. Click the RSVP buttons for details, including speaker abstracts, speaker bios, locations, and directions, and of course to let us know you'll be joining us! *The holiday bash is on the second Thursday of the month (not on our usual "third Thursday"). 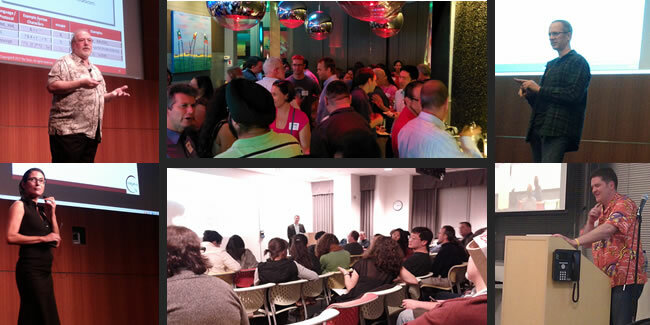 Admission: most IMUG events are $5, and free for members, volunteers, and employees of that evening's host company. Membership is only $20, annual renewals are $15, and lifetime membership is $100. Join today! Unless otherwise noted, all materials on this site are copyright © 1995 IIMUG. All rights reserved.